Today, most game parks have some kind of lodge facility, be it luxury modern hotel or a permanent tented camp. Participants enjoy a round of game drives, relaxation at lodge swimming pools, sumptuous buffets, and more game drives. 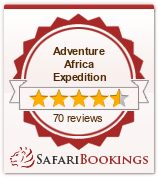 Such a safari is not everyone's dream of Africa adventure, but it is terrific vacation. Lodges come in many shapes and sizes. Their general quality is very high in terms of comfort, cleanliness, and service. Each facility has its own ambiance. The newer safari lodges are modern hotels designed for harmony with natural setting. Spacious verandahs in bars and dinning rooms look out over game-viewing areas. Attractive grounds mix native vegetation with brilliantly flowering tropical plants. Rooms are comfortably cool, pleasantly furnished, and faultlessly clean. For a break from game viewing, guests can relax at the lodge swimming pool. Food is excellent- the buffet tables fairly groan under the weight of platters of delectable fruits, cold-cut meats, hot dishes, and sweets. Many lodges are famous for their beauty as well as comfort. They are often situated in fantastic locations, overlooking stunning landscapes well visited by game. Some other are well placed, usually at strategic water points, that game can be seen at any time. For those tired of beating the bush, an afternoon spent relaxing at the lodge can be just as productive as a game drive. Overwhelmingly, the most popular type of African adventure is the lodge safari.